2 PCS FLEXIBLE WANDThis listing is given by CC&SS ,we are not responsible for if you order low quality or counterfeit product in lower price from other seller,You could play with two or more cats at the same time, it will be the memorable time that playing with them . 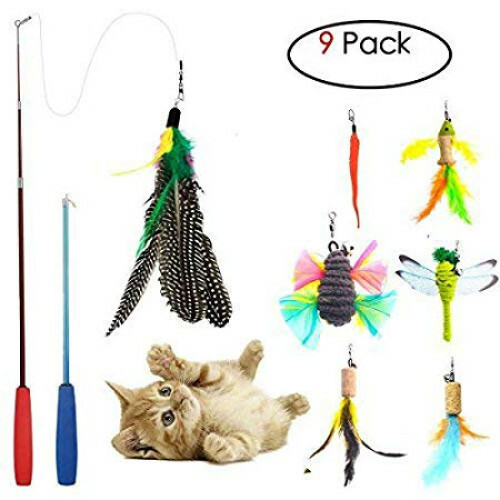 MAKE MORE FUN FOR CATSThese cat toys set include 6 Pcs natural feathers and bell ,you can change the teasers head to make more fun for your cats and the bell sound also attract cats . Amazing retractable wandLength of pole: 35 inch, string: 14 inch. Fishing rod can be telescoped to 14 inch when not in use, which is perfect for very convenient storage and portability.